Extra Wide Diabetic Socks For Swollen Feet - 2 Piece Gift pack!,Socks to take care of swollen feet and edema. Stretch care socks that are extra wide and for diabetics. Get a special 2 piece pack at the price of one! 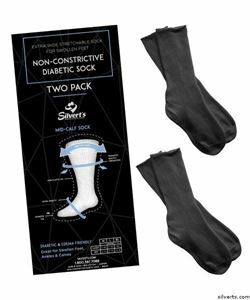 Extra Wide Diabetic Socks For Swollen Feet - 2 Piece Gift pack! Socks to take care of swollen feet and edema. Stretch care socks that are extra wide and for diabetics. Get a special 2 piece pack at the price of one! These diabetic socks are extra wide and stretchable that are made especially for swollen feet. The socks are ideal choice for diabetics with seamless toes that prevent skin irritation. Socks are pre shrink and are made of cotton. Get 2 packs at the price of 1. Available in 2 colors and 3 sizes.